3D printing and individual inventors – a perfect match? Perhaps the inventor of the "Roller Cane" should have 3D printed a prototype first, to see if any cane-using friends would have actually used it. It happened at nearly every social event I attended. 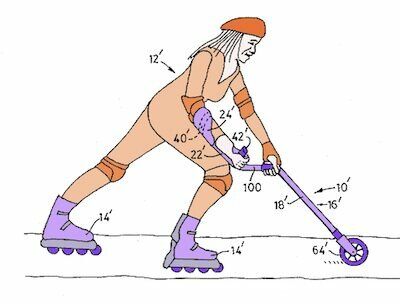 Once my conversation partner found out I was a patent attorney, they’d say, “I have this great idea! You should get a patent for me.” This would always be awkward, as I felt obliged to discuss why filing for a patent was likely not the best first step for the great majority of inventions by individual inventors (as compared to inventions made for corporations). This was especially the case for household improvement-type inventions. For want of a better term, I am going to call these inventions “gadgets.” Some examples are unusually shaped tape-dispensers, plug outlet organizers, compact umbrella seats … the list is endless. I have worked on a number of gadget inventions over my career and I am uniformly dismayed at how getting a patent doesn’t seem to help getting the potential product on the market. In worst case scenarios, the rather fickle patenting process was a fatal capital drain. But now technology has handed me a much better response, “Look into investing in a prototype made with 3D printing. You might even be able to manufacture using the process.” Obviously, this will not work for all inventions, but for many party-goers’ inventions would be a terrific first step. The potential advantages are multi-fold. For a subset of inventions, 3D printing can be used to manufacture parts or even the entire product. Costs have come down so drastically and the number of 3D printable materials has increased so dramatically, this is a viable approach for more and more gadgets–type inventions. But even if 3D printing manufacturing isn’t feasible, there are still good reasons for starting with at least one 3D printed prototype. To adapt a cliché, one polished, functioning 3D prototype is worth a thousand words during a pitch to potential investors (who can pay for the patenting process, if desired) or a potential retailer. Another possible advantage of prototyping is if the product proves less than ideal on use, the inventor can test and optimize. It’s never a bad thing to hit the market with the most functional expression of a new idea. One caution is to make sure that a nondisclosure agreement (a NDA, also known as a confidentiality agreement (CDA)) is signed by the 3D printing shop and by any potential investor or other non-inventor to whom the prototype is shown. Free sample NDA/CDA agreements can be found on the web and, if needed adapted for a small fee by an attorney. For more, an agreement can be drafted from scratch. An even more expensive approach to this issue is to file a provisional patent application before disclosure, but this step should be investigated with a patent attorney to make sure it makes economic sense. 3D printing is an amazing technology that definitely should be investigated by individual inventors before investing precious capital into other approaches, such as immediately filing a patent. For many, 3D printing prototyping technology may be the right first step for getting that gadget made and on the market. Michelle Lewis is an intellectual property attorney who most recently has worked as in-house counsel protecting biotech and pharma inventions, but has a soft place in her heart for individual inventors. She is currently in transition and open to new opportunities. You can learn more about her background at Linkedin. She very recently joined the Law Offices of Peter Mlynek in an "of counsel" position so inquiries about patent prosecution, opinion, or advice work are also welcome.